One of the best ways adults can help young grievers is to listen to their stories. Telling their story is a healing experience. What do bereaved children need? After a death, many children want to share their story. They may want to tell you what happened, where they were when they were told about the death, and what it was like for them. Telling their story is a healing experience. One of the best ways adults can help young grievers is to listen to their stories. Children also need continuity, care and connection. It is important to maintain normal activities at home, at school and in the community wherever possible. Talk to your child’s school and teacher about what has happened as soon as you can so that they are able to provide extra support for your child. Take time to give your child plenty of hugs and cuddles. Grief can be a very lonely experience for children and adults. It’s important that your child continues to feel looked after and cared for. It may help to ask other family members and friends to help you care for your child / children in the weeks following the death, when your own grief is overwhelming. When an important family member dies, the whole family can feel fractured and incomplete. It’s quite natural to want to withdraw for a while and it is at this time that children can feel lonely and disconnected from their grieving parent. It’s important that your child is able to still feel connected to the parent who has died and to you. You can help them to do this in the practical ways listed below. did I cause my parent to die? The death of a parent can shake the foundations of a child's belief in the world as a safe place. Your child will need plenty of reassurance and encouragement to begin to feel safe again. Some children may worry about getting sick and dying themselves and it may reassure them to visit your family doctor for a check-up. It's a good idea to give the doctor a ring before you visit so that they can be prepared for any questions your child may ask. Keeping communication open with children and young people can be the greatest challenge for a grieving caregiver. Children may not necessarily wish to talk but they need to be able to express their grief and sadness. Below are some practical suggestions to help you with this. How you can help children explore and express their grief? Talk about the person who has died and use their name. Make a memory store/box and use this to store precious things that offer memories of the parent who has died. Pool the available photos and make copies for all the children concerned. Create an album of photographs and stories. Keep a journal of memories. what was their favourite food? what was their favourite place? what was their favourite TV programme? It is important for children to have some of the special objects that belonged to their parent. These might be items of clothing, jewellery or other objects. Your child will talk when they are ready and usually in small bursts. These are precious windows to your child's understanding of what has happened. Create special and unique rituals or remembrance activities. Children often protect their parents fearing that they will bring further sadness if they express their grief. Sometimes children experience difficulties with grief and may need professional help. The following are signs that your child may need help. Many of these signs are normal following the death of a parent but may indicate a problem if they continue for a long time and don't seem likely to change. Has continuing difficulty talking about their parent who has died. Is displaying aggressive behaviour and anger. Has unexplained physical symptoms and discomfort such as stomach aches and headaches. Has sleeping difficulties and eating disturbance such as eating excessively or having very little appetite. Doesn't want to socialise with friends or others outside the family. Has serious academic reversal, inability to concentrate or behavioural problems. Has continuing blame or guilt. Engages in at-risk behaviour and talks about wanting to hurt themselves. Therapy offers the older child or adolescent the opportunity to talk about very difficult things in a safe and non-judgemental environment. The therapist or counsellor may suggest that you come with your children and that you all talk together. Children under about 8 years will need the opportunity for expression that play therapy offers. Remember that very young children and infants are also deeply affected by the loss of a parent although their way of managing the feelings will not always be obvious. It is very important to check, and OK to ask, whether the clinician has clinical training and experience in working with children and young people. Your clinician should also be a member of one of the following. Your counsellor should be a member of New Zealand Association of Counsellors (NZAC). You can check whether a counsellor is a member by asking the individual counsellor to show you their certificate, by emailing membership@nzac.org.nz or by phoning 64 7 834 0220. Your adult psychotherapist should be a member of New Zealand Association of Psychotherapists (NZAP). To find an adult psychotherapist in your area, you can contact the executive officer of NZAP. Phone: 64 4 475 6244; Fax: 64 4 475 6254; Postal address: PO Box 17-361, Karori, Wellington. Your child psychotherapist should be a member of New Zealand Association of Child and Adolescent Psychotherapists (NZACAP). See the NZACAP website to find a psychotherapist in your area, or to see if a specific psychotherapist is a member of the NZAP. Your psychologist or clinical psychologist should be registered with the New Zealand Psychologists Board. Their website has an online register of psychologists. It also provides the Board's contact details. You can contact a counsellor, psychotherapist orpsychologist through your family doctor, by calling Skylight free on 0800 299 100 or by checking your local phone listings. 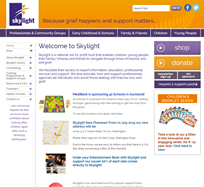 The content on this page has been developed by the Paediatric Society New Zealand in collaboration with Skylight. It is used here with the permission of Skylight. The content has been approved by the Paediatric Palliative Care Clinical Network. This page last reviewed 07 April 2017.